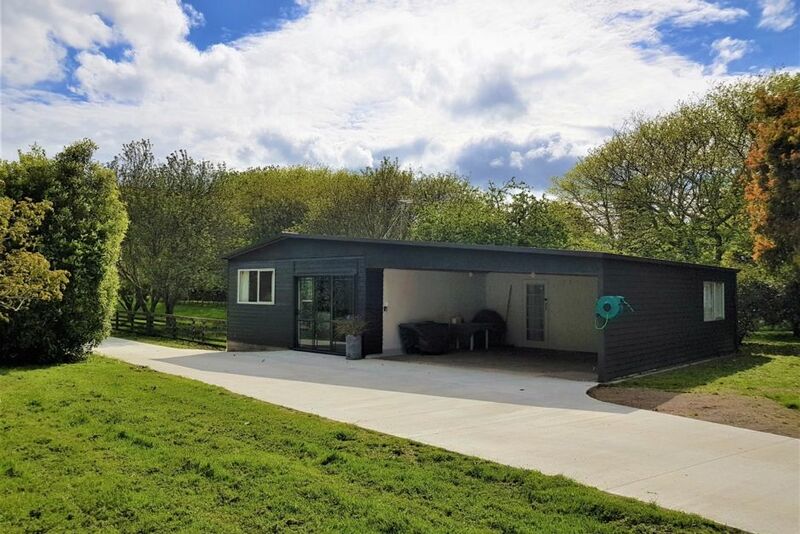 Clean and tidy, compact, basic self contained unit situated on a 12 acre family farm in the tranquil suburb of Paradise Valley, Rotorua. Approximately 9kms from Rotorua town centre, 15 minuntes drive from the excellent mountain biking tracks at Waipa and Whaka Forest and 20 minutes drive to the picturesque lakes district. The cooking facities comprise of a toaster, jug, fridge, microwave, electric frypan and bench top grill/hot plate. The kitchen area is separate and has a sink, bench and cupboards. Cutlery and crockery are provided. There is also a gas BBQ together with an outside table and four chairs for use in the carport. The accommodation has a lounge/diner. The front bedroom contains a queen bed and tall boy. The back room contains twin bunks and a single bed (these have foam mattresses). A port-a-cot is available for use if required. The bach provides a rural, family friendly base for your stay in Rotorua with space for the children to play outside and view their animal neighbours sheep, chickens and horses. Please note that we have two dogs, this is specifically mentioned in case dogs are an issue for prospective guests. The bach is conveniently located to a number of tourist attractions including Paradise Valley Springs and Lion Park, Skyline Skyrides Gondolas and Luge, Rainbow Springs, the Agrodome, Mitai and Te Puia. There is grass parking for a boat, trailer etc. Please Note The Tariffs Are Based Upon Occupancy Of Up To Two Persons For Two Nights Or More. An Additional $15 Is Required For Each Extra Adult Guest andamp; An Additional $10 Per Extra Child Per Night. Sorry No Stays Of One Night Only. Two oil fin electric heaters. Please keep the driveway clear to allow access past the bach. Vehicles may be parked in the car port and on the grass to the side of the bach. Carport with gas BBQ and plastic table and chairs. We enjoyed our stay here very much, nice quiet surroundings, animals to interact with and the hostess was very friendly and helpful. The unit is a little quirky, but comfortable and has everything you could need for a short or longer term stay. The single beds are suited to children, not recommended to anyone with a back issue but the queen bed was very comfortable. Good value for money, I would definitely return if travelling that part of the country again. We loved the batch. Loved the rural country setting. Loved seeing the animals. Missed not having WiFi. The accommodation was clean, tidy, comfortable and surprisingly spacious. A peaceful rural setting but still only a few minutes to Rotorua's attractions. It had everything we needed and the owners were helpful and responsive communicators. My family of five was delighted with the little house, had everything we needed for a great price. Was surprisingly spacious.